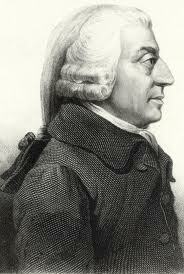 Adam Smith is perhaps the most misunderstood and pigeonholed thinker in the Western tradition. Recently, Jack Russell Weinstein’s Adam Smith’s Pluralism (see my review here) spurred me to think more carefully about my own personal distortions of Smith’s work. It is not uncommon to boil down the Scottish philosopher’s ideas into a handful of choice labels: laissez-faire, self-interest, the Invisible Hand, and the division of labor. These labels, in turn, are distorted by a haze of politicized connotation, completely blurring Smith’s complexities from our vision. Part of this epidemic of ignorance stems from a neglect of one of Smith’s books The Theory of Moral Sentiments. I often have wondered what would happen if we banned the reading ofThe Wealth of Nations until a person has read through the Sentiments. There are at least a few good reasons for doing this. First, the Sentiments was written almost two decades before The Wealth of Nations. Second, the Sentiments sets out Smith’s principal ideas for his ethics, politics, and economics, building them around a philosophy of sympathy, which is almost a jarring contrast to the economic interests at the center of The Wealth of Nations. Finally, without the basic framework that is set out in the Sentiments as a foundation to the rest of Smith’s work, we run the risk of perverting Smith’s philosophical system into something that is almost entirely of our own invention. Two examples on this point should suffice. There can be no proper motive for hurting our neighbor, there can be no incitement to do evil to another, which mankind will go along with, except just indignation for evil which that other has done to us. To disturb his happiness merely because it stands in the way of our own, to take from him what is of real use to him merely because it may be of equal or of more use to us, or to indulge, in this manner, at the expense of other people, the natural preference which every man has for his own happiness above that of other people, is what no impartial spectator can go along with. Every man is, no doubt, by nature, first and principally recommended to his own care … But though the ruin of our neighbor may affect us much less than a very small misfortune of our own, we must not ruin him to prevent that small misfortune, nor even to prevent our own ruin. We must, here, as in all other cases, view ourselves not so much according to that light in which we may naturally appear to ourselves, as according to that in which we naturally appear to others…When he views himself in the light in which he is conscious that others will view him, he sees that to them he is but one of the multitude in no respect better than any other in it. How many people ruin themselves by laying out money on trinkets of frivolous utility? What pleases these lovers of toys is not so much the utility, as the aptness of the machines which are fitted to promote it. All their pockets are stuffed with little conveniencies. They contrive new pockets, unknown in the clothes of other people, in order to carry a greater number … some of which may sometimes be of some little use, but all of which might at all times be very well spared, and of which the whole utility is certainly not worth the fatigue of bearing the burden. If we neglect the conservative moral system at the heart of Smith’s thought, we will always be refashioning , oversimplifying, and twisting him into something that we want him to be, rather than appreciating him for what he actually was. Smith was a dutiful student of Francis Hutcheson, whose notion of “moral sense” is heavily present in Smith’s writing. I absolutely agree that Smith is too often misunderstood due to the separation of his later and more famous work on economics from his foundational work on ethics. He was chair of moral philosophy at Glasgow if I’m not mistaken. Frederic Bastiat also picks up on these themes in the 1800s to counter the socialist movement in France and Germany.